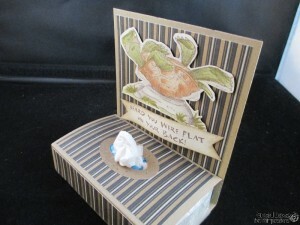 Today we need to make a bag or a box for this challenge , I chose to make a kleenex box holder.It’s flu and cold season and who wouldn’t love one of these sitting at their desk . 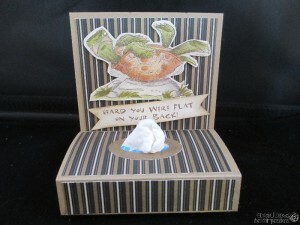 I used the Turtle sku #L1603 and the sentiment Flat on Back sku #E1678 . 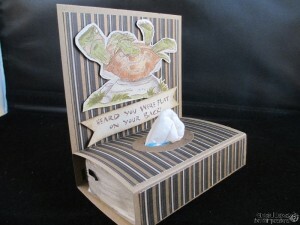 I used score tape in 1/2 flap to secure the box after designer paper is added .I fussy cut my turtle image after I colored with the copic markers , I added some shimmer pen to him also I used glue dots to pop him up , added a sentiment banner and I am done . Awesome idea! 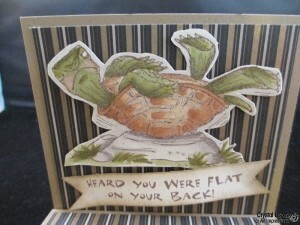 I love the turtle stamp and saying – that would bring a smile to someone not feeling well. 🙂 The coloring on your turtle is great!